Visible Ink Press : Which extraterrestrial superhero became a key fixture in the Justice League of America? Which extraterrestrial superhero became a key fixture in the Justice League of America? He was marooned on Earth by Professor Mark Erdel. He hides among the humans under the name John Jones. He uses his alien mental abilities, such as telekinesis, to perform feats such as flying. In his Martian form, he stands seven feet tall and weighs three hundred pounds. Although the debut of DC Comics' second Flash (Showcase #4, 1956) is universally regarded as the start of the Silver Age of comics (1956-1969), J'onn J'onzz, the Martian Manhunter--a second-string superhero--predates the Flash by nearly a year. Created by writer Joe Samachson (scripter of many Seven Soldiers of Victory and Sandman tales for DC) and artist Joe Certa (who had drawn DC's Robotman and Fawcett's Captain Marvel Jr.) as a backup feature for Batman and Robin (Detective Comics #225, 1955), the Manhunter is accidentally teleported to Earth from his native Mars by Professor Mark Erdel, whose "robot brain" has locked onto him from across the unknown depths of time and space. Terrified by the sudden appearance of J'onn J'onzz--a thick-browed, nearly seven-foot, 300-pound green humanoid--the professor immediately keels over dead, leaving the Martian stranded on Earth. Altering his appearance with his natural shape-changing abilities, the Martian assumes human form, anglicizes his name to "John Jones," and takes on a day job as a terrestrial police detective, using his innate telepathic powers to trick his human colleagues into believing that they already know him. In his spare time, J'onzz uses his other talents, including invisibility, flight (derived from telekinesis), superstrength, superspeed, and "Martian vision" (similar to Superman's heat-vision)in a relentless war against both street criminals and costumed villains. His major weakness is fire; just as kryptonite is Superman's Achilles' heel, the Manhunter is powerless in the presence of open flames. During his first few years on Earth, J'onzz uses his invisibility power to conceal his superheroics, and relies mainly on his detective skills to solve crimes (his feature was in Detective Comics, after all). This changed in 1959 (Detective Comics #273), when he lost his ability to use his other powers while invisible. His existence subsequently becomes common knowledge, and he becomes widely known as the Martian Manhunter. This leads to his eventual decision to ditch not only his "John Jones" identity (at first in favor of whatever human form the crisis du jour requires him to take) but to stop adopting human guises altogether in favor of full-time superheroics in his alien form. His demeanor is distant and logical, a classic "outsider" personality that anticipates Star Trek's Mr. Spock by more than a decade. With J'onzz's identity changes still underway during his Detective run, J'onzz found himself in the hands of writer Gardner Fox and artist Mike Sekowsky, serving double duty as a charter member of the Justice League of America (The Brave and the Bold #28-#30, 1960; Justice League of America #1, 1960), DC editor Julius Schwartz's wildly successful revival of the defunct 1940s superteam the Justice Society (also written by Fox, this feature had ended in All-Star Comics #57, 1951). It is only in this capacity--as a supporting character in an ensemble title--that the Martian Manhunter finally began appearing on comic book covers. While J'onzz remained a major player in the JLA, his Detective Comics run ended in 1964 with issue #326, with the Elongated Man (a future JLA member) taking his place; two months later, the Manhunter's feature resurfaced in the pages of The House of Mystery (beginning in issue #143), a title that had previously run only anthology-style horror, science fiction, and fantasy tales. Now helming his own feature and commanding a spot on each issue's cover, J'onzz had definitely moved up in his adopted world. Unfortunately, the character proved not to be quite the draw DC had hoped, and he lost his cover slot to a new lead feature, Dial 'H' for Hero (House of Mystery #156, 1966). The following year, J'onzz found himself bereft of even back-page status (as ofHouse of Mystery #174) and had only the Justice League's headquarters to call home. Thanks to the flybys of Mars performed by the Mariner spacecraft in the 1960s, planetologists--as well as the comics readership--became aware that the real Mars was incompatible with sentient life, such as the Martian Manhunter. DC therefore had to engage in some judicious "retconning" (retroactive continuity) to better explain J'onzz's origins. When the Manhunter finally returns to his homeworld (Justice League of America #71, 1969), he makes the horrific discovery that something has purged the Red Planet of all life. He also learns that his people had fled whatever menace had killed the Martian biosphere, and leaves the JLA--and the four-color page--to find them. His quest is ultimately successful, and he eventually returns to Earth and his fellow heroes (Justice League of America #100, 1972). During the 1980s and 1990s, J'onn J'onzz continued to be a stalwart member of the JLA and Justice League International, becoming almost a father figure for some of the younger and brasher members of the team, such as the Blue Beetle, Booster Gold, Fire, and Ice. In fact, he has been integral to every incarnation of the Justice League from the very beginning. Under such writers as Keith Giffen, J. M. DeMatteis, Dan Jurgens, Gerard Jones, and Mark Waid, J'onzz loosens up a little emotionally, developing a dry sense of humor, though he is still often played as a silent, stolid straight man for banter-prone characters such as the Blue Beetle. During the 1990s, the Manhunter becomes the Justice League's chairman; his leadership skills are praised by no less a personage than Batman himself (JLA #2, 1997), who says J'onzz has "the best grasp of group dynamics of anyone I've ever met." As has happened with many superheroes, the Martian Manhunter's origin story has been embroidered greatly during the last two decades, making him increasingly complex and more relevant to modern audiences. In 1988, J'onzz starred in a four-issue Martian Manhunter miniseries, in which writer DeMatteis and artist Mark Badger plagued the Manhunter with a vision of H'ronmeer, the Martian god of death, fire, and lies. This culminated in several shocking discoveries, including the fact that Dr. Erdel still lives. Erdel reveals that the Manhunter, grief-stricken over the deaths of his wife, daughter, and entire species from a plague, had lashed out in pain and destroyed Erdel's teleportation apparatus, thereby stranding himself on Earth. The Manhunter's vulnerability to fire turns out to be purely psychosomatic, a post-traumatic manifestation of J'onzz's repressed memories of his dead world's funeral pyres. To heal J'onzz's shattered psyche, Erdel had implanted happy memories of Mars based on old pulp science fiction stories--the Manhunter's Martian appearance is one such piece of implanted information. Erdel then faked his own death to leave J'onzz free to adapt to his new life on Earth. Using Erdel's rebuilt equipment, the Manhunter returns briefly to Mars, where he bids farewell to everything he has lost. When he returns shortly thereafter to Earth, he regards it as his home, more now than ever before. 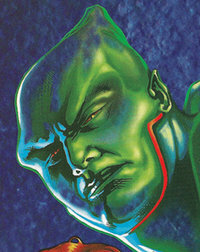 Working with artists Tom Mandrake, Eduardo Barreto, and Jan Duursema, writer John Ostrander helmed an open-ended Martian Manhunter series that ran for thirty-six issues (1998-2001). Noting J'onzz's conspicuous lack of a "rogues' gallery," so typical of other superheroes, Ostrander embellished the character's backstory further by introducing his evil brother Ma'alefa'ak J'onzz (who is better known by his supervillain moniker, "Malefic"), the architect of the plague that destroyed the Martian people. Ostrander also intertwined the history of Mars and the J'onzz family with Jack Kirby's New Gods characters, revealing that the Martian Manhunter has long been an enemy of the diabolical and supremely powerful quasi-deity known as Darkseid. In Martian Manhunter 1,000,000 (1998), Ostrander and Mandrake served up a possible future in which the Martian Manhunter is alive and performing heroic deeds on Mars in the year 85,271 c.e. J'onn J'onzz was killed off in Final Crisis #1 (July 2008), but was soon resurrected in Blackest Night (2009-2010). The Martian Manhunter joined Stormwatch, a superhero team originally published by WildStorm, in their new DC series starting in September 2011. Phil Morris played the Martian Manhunter in the live action television series Smallville. The Martian Manhunter has appeared many times in animation: as a regular in the television series Justice League and Justice League Unlimited; as a guest star in several episodes of Batman: The Brave and the Bold; and in the direct-to-video animated films Justice League: The New Frontier (2008), in which he was voiced by Miguel Ferrer, and Justice League: Crisis on Two Earths (2010). "[J'onn J'onzz is] the alien on Earth who still remains alien," Ostrander has said of the taciturn extraterrestrial hero. "And thus he's the most classic in terms of a detective as well--if he remains the classic outsider, unlike Superman, who was raised to almost think of himself as human. J'onn always has known that he's the alien and yet, at the same time, he feels very close [to] and very identified with the people of Earth." Today he remains a key player in the DC universe, a long-lived character whose alien-ness remains both intact and intriguing.